On January 20, dozens of New Zealand police's elite special forces broke into Kim Dotcom's mansion with assault helicopters, M4A3 automatic weapons, Glock pistols, dogs, sledgehammers and even a circular chainsaw, as if they were expecting a vicious narco gang waiting inside, armed to the teeth. What they found instead was two kids—three and four years old—a 15-month old baby, some Filipino nannies, two security guards, Dotcom's bodyguard Wayne Tempero, Dotcom's wife and meganerd Kim Dotcom himself, hiding in the security room you are seeing in this video. Tempero told the story on how the Kiwi cops assaulted the Megaupload founder's home and how they captured Kim himself to Kiwi news channel 3news. It sounds pretty scary and way out of proportion, given the nature of the alleged offense and the people involved. The operation started at 6:45, when the thunder of the assault helicopters woke up the body guard and everyone in the house. He stepped outside to see the helicopters when a policeman in a bulletproof vest asked him to surrender. He didn't have any weapons and he complied. He also said that he couldn't even hear them identifying themselves as police officers because of the sound, but obviously these weren't low-rent kidnappers. As this was happening, the elite squads and police officers were going around the house, smashing doors and looking for Kim Dotcom with dogs. In the childhood area they found the kids and the Filipino nannies. According to Tempero, the police asked the Filipino nannies—who must be famous in New Zealand for their ferocity and skills in explosives manufacturing—if they had any bombs. They also found the wife, who tried to give them the code to open the door to Kim Dotcom's quarters before they attempted to slam the doors down. 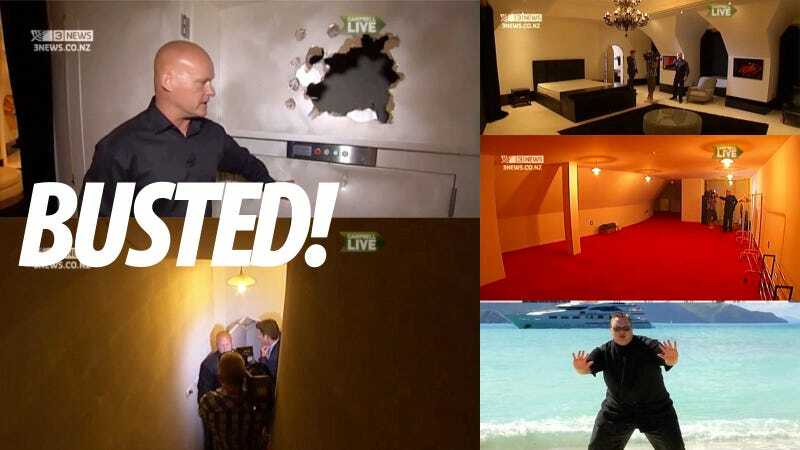 Dotcom had run to his secure Red Room, where he stayed for 30 minutes until he was apprehended. On the way to get him, the police smashed an old elevator door thinking it was the gate to a secret room. Nobody in the house had a history of violence. Only two shotguns, with legal licenses, were stored in a gun locker. Neither Dotcom nor the security guards had any gun on them. Tempero says that the whole thing was out of proportion and it sure seems like it. He says that Dotcom, who apart from his bad taste and huge appetite, seems like any regular nerd, "would have complied with everything, we would have sat at the large table, he would've probably offered them breakfast and he would have complied with everything." Of course, he is his bodyguard, but it doesn't seem like an outlandish claim to me. So why did the New Zealand government send this brutal group of forces to take down a fat nerd, his wife and his kids? I'm sure they knew who was in the family mansion as well as the impossibility of Dotcom erasing evidence about his activities—which they already had and it was pretty damn huge. It seems reasonable to think that this is something that the FBI and any police halfwit working in the case should have known about. The only plausible explanation, apart from being super-extra-careful because they thought that John McCain may be hanging around somewhere, is that they wanted to set an example. Perhaps the Hollywood moguls who were so eager to set an example and scare every other download service in the world, pushed for it. Or maybe these New Zealand policemen watch too many of their movies. In any case, the fear strategy has worked: download services all around the world—many of which are used legitimately—are either shutting down for good or closing access to people in the United States.